Robert Schumann: Excerpts from Carnaval, Op. 9 "Little Scenes on Four Notes"
A vital aspect of Jürgen Budday's interpretation of George Frideric Handel's The Messiah, apart from matters of performance practice, is his focus on the work's dynamic conception. Dynamics are notated in the autograph manuscript, but Handel further annotated the Dublin score to mark the ripieno passages. By adding shifts in ensemble strength to the alternation of piano and forte, Handel evokes an ample measure of contrast and colour. Handel's dynamic indications in The Messiah go beyond the usual forte, piano and pianissimo to include mezzo piano and un poco piano, markings by which he intended an even finer differentiation. One would do well, when preparing a performance, to observe the ripieno indications in the Dublin score, as they are for the most part essential to Handel's dynamic conception. Examples in point include the arias Comfort ye (No. 2) and Ev'ry valley shall be exalted (No. 3); the choruses And the glory, the glory of the Lord (No. 4) and His yoke is easy, His burthen is light! (No. 18); as well as the beginning of the Hallelujah chorus (CD II, No. 16). The Maulbronn interpretation takes this dynamic conception seriously and clearly differentiates solo and ripieno sections in the numbers just mentioned. This inevitably gives rise to novel and more subtle auditory impressions, for which the beginning of the Hallelujah chorus provides a clear example. Elsewhere, Handel's senza ripieno indications appear to have been motivated more by consideration of the technical inadequacies of his ripienisti, and therefore were not observed in the Maulbronn performance. The libretto and the music, each in itself and together as a whole, form a providential unity. The libretto, ascribed to Charles Jennens, is no mere compilation of Bible quotations, and Jennens made various changes to the wording of the selected text passages. In the course of successive performances, Handel composed variants of some of the arias to fit the immediate occasion or circumstances. For the Maulbronn performance, those variants were chosen that Handel himself is said to have preferred. 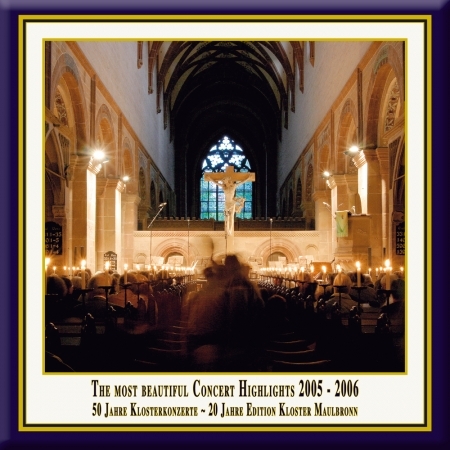 This live recording of Handel's The Messiah is part of a cycle of oratorios and masses, performed in the basilica of Maulbronn Abbey under the direction of Jürgen Budday. The series combines authentically performed oratorios and masses with the optimal acoustics and atmosphere of this unique monastic church. This ideal location demands the transparency of playing and the interpretive unveiling of the rhetoric intimations of the composition, which is especially aided by the historically informed performance. The music is exclusively performed on reconstructed historical instruments, which are tuned to the pitch customary in the composer's lifetimes (this performance is tuned in a' = 415 Hz). The concert: "Baroque in Blue · A Crossover between Early Music & Jazz"
Established in 1988 by Friedemann Immer, the Friedemann Immer Trumpet Consort dedicates itself to the music played by the trumpet ensembles of the Baroque age The Consort's programmes exude the wonderfully resplendent sound typical of the music of that time. All the members of the ensemble are specialists in old music and, accordingly, the trumpeters play baroque trumpets that have no valves. In doing so, they are treading in the footsteps of a profession that was highly regarded at a time when powdered wigs and buckled shoes were de rigueur. The trumpet players employed at the courts and in the towns, who provided the necessary musical accompaniment at coronations, weddings, tournaments and other festive occasions, banded together in guilds of their own that had extremely strict rules and regulations. The ensembles were made up of three to eight trumpeters and timpanists, supplemented by strings, woodwinds and continuo instruments. In its "normal" line-up, the Friedemann Immer Trumpet Consort is accompanied by timpani and organ - so that the magnificent sound of the trumpet stays firmly in the forefront of things. In some works, the organ takes over the string part - an arrangement that is totally in keeping with the practice of the times. The ensemble's repertoire encompasses all of Baroque music. The line-up is unusually large for a standing ensemble of Baroque trumpets and allows a lot of different options in the way of variations. So the Consort not only performs works for one to six trumpets with accompaniment, it also presents - along with outstanding song soloists - cantatas and arias with all the original parts being performed. In many a project, strings are also brought in. And, as what can be done musically and sound-wise on the Baroque trumpet differs quite considerably from anything that its present-day "daughter" with all its valves can do, the ensemble has also turned to interpreting modern works on the Baroque trumpet - and they are probably totally alone in this. The repertoire of the Trumpet Consort not only includes original works by Benjamin Britten, for instance, but quite a large range of jazz pieces as well. Since its formation, the ensemble has been giving concerts both at home and abroad. They have played at many different festivals, examples being the Arolsen Baroque Festival, the Styriarte in Graz and the Kokutopia Festival in Tokyo as well as the International Trumpet Guild Conference and the Historic Brass Symposium in the USA. The concert: "Hosanna in excelsis · Music & Poetry in the Middle Ages"
The concert: "Musica Sacra · De Maria Virgine"
The Moscow State Academic Choir is one of the oldest and most famous of Russian choruses. The choir was founded in 1956 by the venerated conductor Vladislav Sokolov, a winner of the Glinka State Prize of the Russian Federation, and a People's Artist of the USSR. Already in 1957, the chorus took first prize at the 6th World Youth and Students Festival in Russia, and has maintained a high profile ever since. The chorus has toured regularly not only in Russia, but also in Western Europe and Asia. A great number of choral works by Russian composers were given their debut by the Moscow State Academic Choir, including Prokofiev's Ivan the Terrible and Kabalevsky's Requiem. Within its broad repertory is a large number of Russian spiritual and patriotic works, the great choral scenes from various Russian operas, and choral versions of Russian and other folk melodies. In 1988, the baton of the Moscow State Choir was passed to Andrey Kozhevnikov, who had been Sokolov's assistant since 1970. Kozhevnikov, a People's Artist of the Russian Federation, and winner of several international competitions, was trained at the Moscow State Choir School and then at the Moscow Conservatory - studying with S.Kazansky and A.Sveshnikov. Under Kozhevnikov's leadership, the Moscow State Choir has resurrected a number of early Russian works, including Degtyarev's patriotic oratorio, Minin and Pozharsky - the first such Russian work, written on the eve of the Patriotic War of 1812; it is among the works featured here at the Classical Archives. from: "Cantigas de Santa Maria"
from: Te Deum for Choir in D Major, HWV 283 "Dettingen"